FINAL DAY IN THE SADDLE. 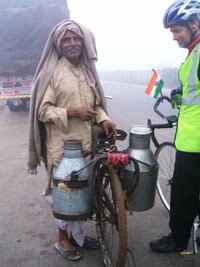 This day last year was our final day of a 2,000-mile bicycle ride from the southern tip of India to New Delhi. It would prove to be both a frightening and fulfilling day. 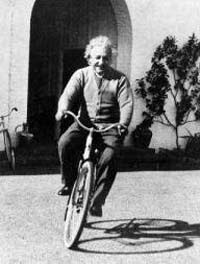 But it’s not likely any difficulty could have dimmed our spirits or deterred us from making the last day of our cycling journey a bright one. DANGEROUS FOG. We rode north out of Kosi in a serious fog. Visibility was extremely low. Objects were not visible until about 30 feet in front of us. It was eerie and dangerous. Vehicles were driving too fast to see us and we were forced off the road several times. 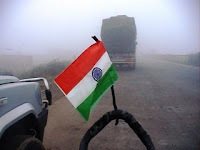 We thought the fog would lift soon, but it persisted most of the way to Delhi. The moisture soaked our clothing and the vehicle spray covered our bikes. INTO DELHI. The sun finally burned the fog away by the time we reached the outskirts of Delhi after noon. We faced a new challenge: plowing our bikes through the capitol's thick bumper-to-bumper traffic. 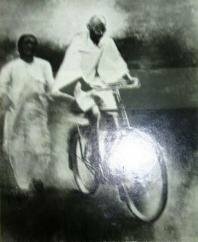 Our experience of pedaling through Bangalore, Hyderabad and Nagpur served us well. 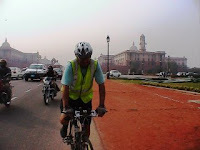 We were tired from the day’s harrowing 75-mile / 120-kilometer ride, but we were psyched as we rode into the heart of Delhi. We’d studied the map of the city enough to know where we wanted to go and how to get there. CELEBRATING AT INDIA GATE. We selected the India Gate in old Delhi as our “finish line,” and we headed straight there. The India Gate is a massive arch, memorializing all India’s war dead. It stands at one end of a grand boulevard on the scale of the National Mall in Washington, D.C. At the opposite end of Rajpath Marg are the Presidential buildings and India’s Parliament (we also visited these sites). 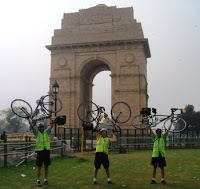 Once we reached the India Gate, we lifted our bikes over our heads and celebrated the completion of the cycling portion of our journey. 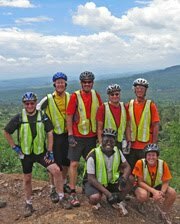 We’d ridden over 2,000 miles / 3,200 kilometers since starting at Nagercoil in Tamil Nadu+ on December 30. The feelings of accomplishment, relief, and gratitude were awesome.